No spending hours on your puff, nor is there any need for store bought. That flaky pastry we talked about? Yup, it's time. Summer has finally hit. And with it, an abundance of tomatoes. *Happy Dance*. Which is an even better excuse to devour tomatoes at every opportunity. Tomatoes are, after all, the essence of summer, and while I desperately wish I had an Italian tomato plantation at the end of my garden, (I guess we can't have everything...), this tart definitely does any and all tomatoes (even those not Italian), justice. I love tomatoes. Raw, roasted, chutney-ed, sauced, pureed, baked, stuffed, sundried, jam-ed. You name it. Big or small. I ain't discriminating. I will eat it. Which is why, when summer comes around, I probably eat them in some form or another, with more or less every meal. Albeit mostly unintentionally, but I can't help the fact they perfectly complement everything I eat; when you eat salt, they add sweet, when everything's fried, they add freshness, when the dish is heavy, they add bite and acidity. Literally everything. Which is why, you need this under your belt. So voilà, my homage to summer, la Tomato Tarte Tatin. 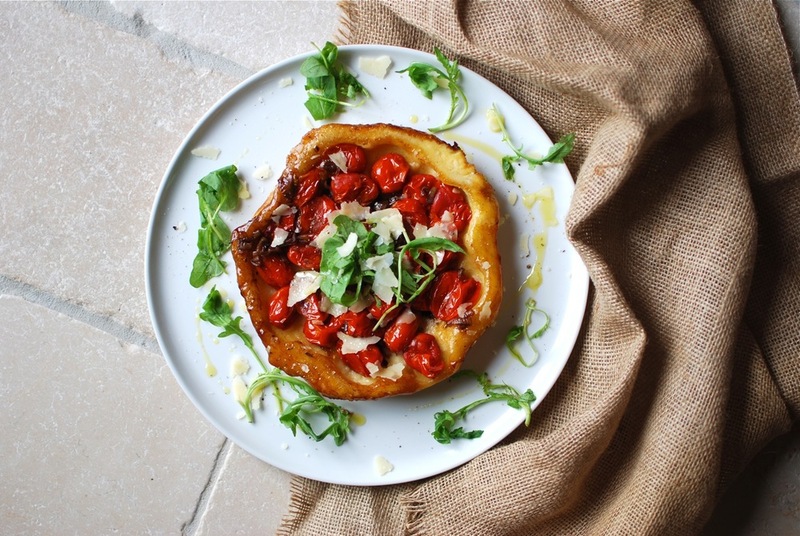 In other words, an upside down caramelised tomato tart. Inspired by Mademoiselle Gourmande's, here's my adaptations; definitely one for the books. Preheat your oven to 210*C Fan/220*C (430F). Roll out your pastry (which you thawed that morning if it was frozen) to about .5cm/.2in, and until about the size of your pan, with a 2.5cm/1inch border - shouldn't need to trim or toss! Prick all over with a fork. 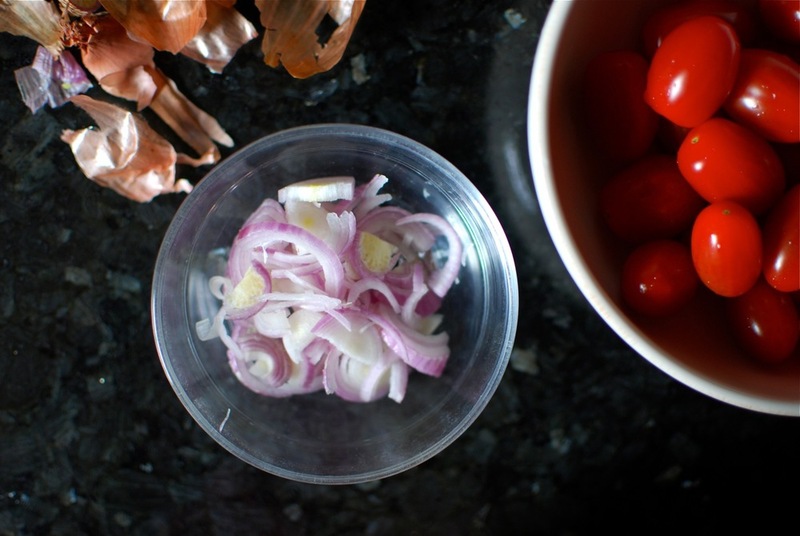 Thinly slice your shallot. In a small frying pan, heat 1 tbsp olive oil on medium-high, promptly adding your shallot, with a pinch of salt and pepper. Toss to coat, and cook until translucent and starting to brown. Add your dried, palm-crushed thyme, and 2 tbsp balsamic, and allow to reduce on low heat. When the balsamic goes in, heat your oven proof pan/skillet on medium-high with 1tbsp of olive oil and your cherry tomatoes, seasoning with a pinch of salt and pepper to taste. Once tomatoes start to blister slightly, turn off the heat. Your balsamic should have reduced perfectly. Arrange your caramelised shallots evenly over the top of your tomatoes. Then carefully lay your pastry over the pan. Fold the excess pastry back over itself, so that the pastry just brushes the pan, hugging the tomatoes all the way around. Pop in the oven. Bake 20-25 minutes - until the juices that were previously bubbling around the edges, have completely reduced, and the pastry top is golden. When done, remove from the oven and allow to cool 10 or so minutes - this is essential or it will come apart when you flip it! Might have learnt from experience... - and until the juices stop bubbling. Take your serving plate of choice, place carefully over the top of the tart and hot pan/skillet, then flip, carefully, quickly, so that your tomatoes are face up on the plate, gently scraping down any stragglers. Finish with a little grated parmesan, freshly cracked pepper, and a drizzle of your best EVOO. And maybe some fresh sprigs of time if you're feeling fancy. With chopped, blanched green beans, tossed in the balsamic residue of your tatin pan with arugula, EVOO and parmesan. A highly recommended, mixed green salad of your choice, vinaigrette, lightly toasted sunflower/pumpkin/linseeds, and avocado. Topped with a feta/ricotta and greens. Try with small whole onions instead of tomatoes (only seen not tried and tested).